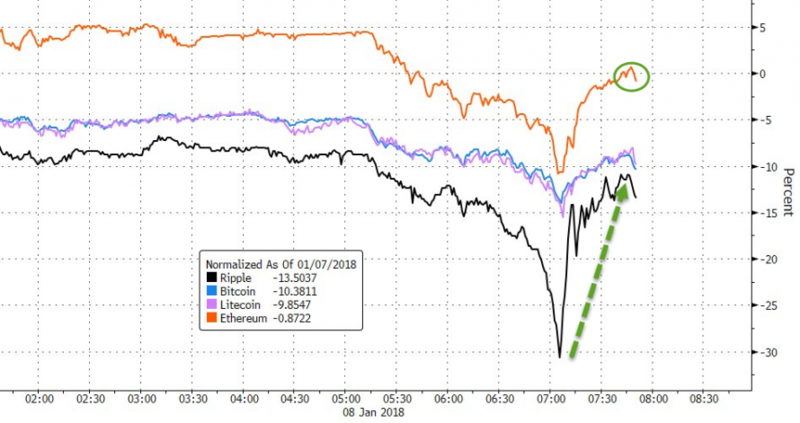 Update (1605ET): Prices for some of the most popular cryptocurrencies dropped sharply Monday, with some such as Ripple suffering a flash crash, from which it however quickly rebounded. One apparent reason - according to the WSJ - for the sudden plunge: an adjustment from a popular website on its digital-currency price quotes. The popular price-tracking website, coinmarketcap.com, on Monday removed data from some South Korean exchanges from its price quotes for a range of virtual currencies including bitcoin, Ethereum and Ripple’s XRP. 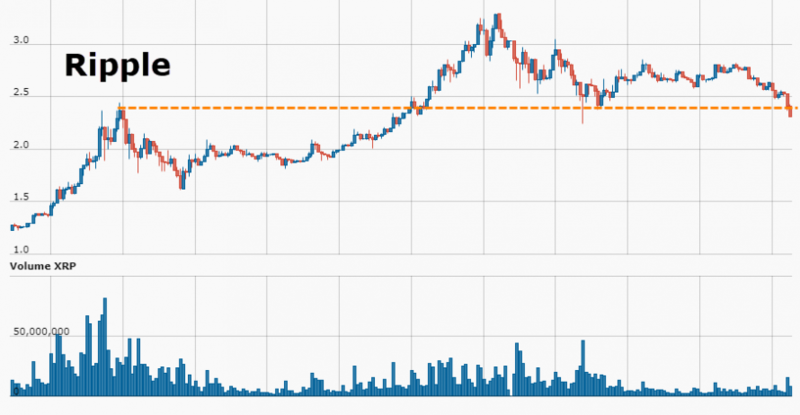 The move followed a South Korean government crackdown on cryptocurrencies. 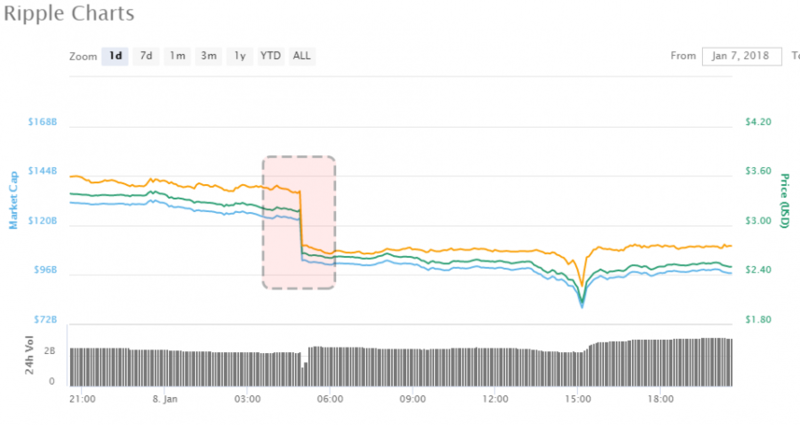 Without the Korean-exchange data, the XRP price fell to about $2.50, and at one point on coinmarketcap.com, fell below $2.10. On Ripple’s website, the company quoted XRP at $2.41, with its source being a weighted average of prices on the U.K. exchange Bitstamp. 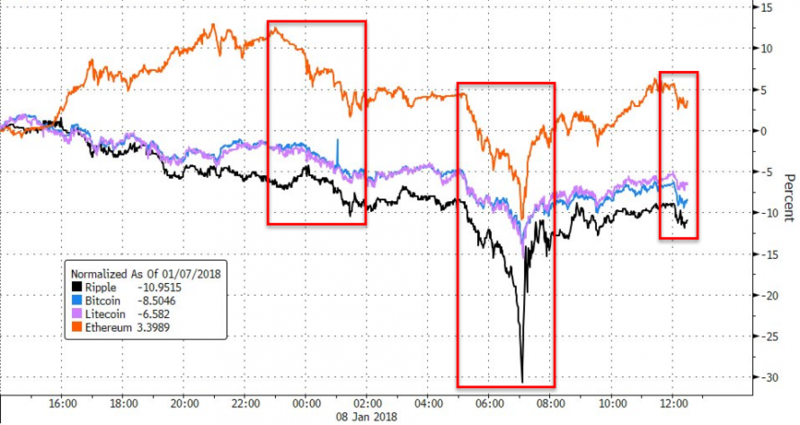 That 'signal' from one exchange was picked up by the various algos and humans that trade crypto and triggered a mini flash crash on a number of other exchanges. 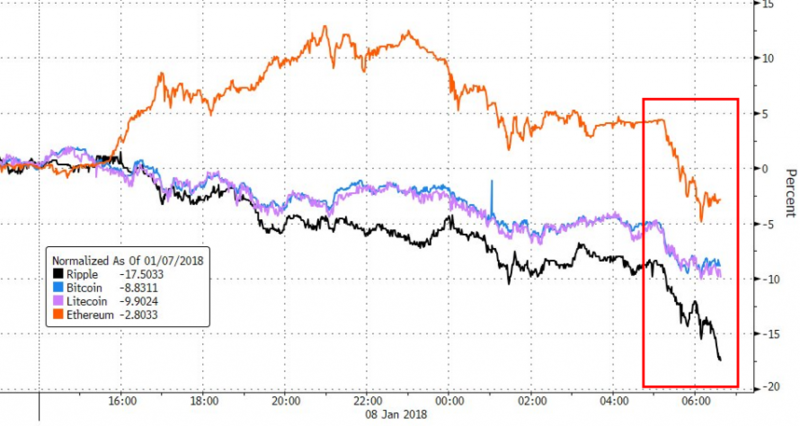 But as the chart below shows, once the initial dump had finished, the machines recognized the lack of real offers and XRP was bid back up to unchanged relative to the pre-crash level. ... which however this time was completely unwarranted. In Japan, authorities embraced the sector, implementing rules for proper trading of bitcoin and other cryptocurrencies. In South Korea, though, the government has been more concerned with the potential for criminal activity tied to cryptocurrencies, and even retail investor losses amid a global mania and what many fear is a bubble in the sector. 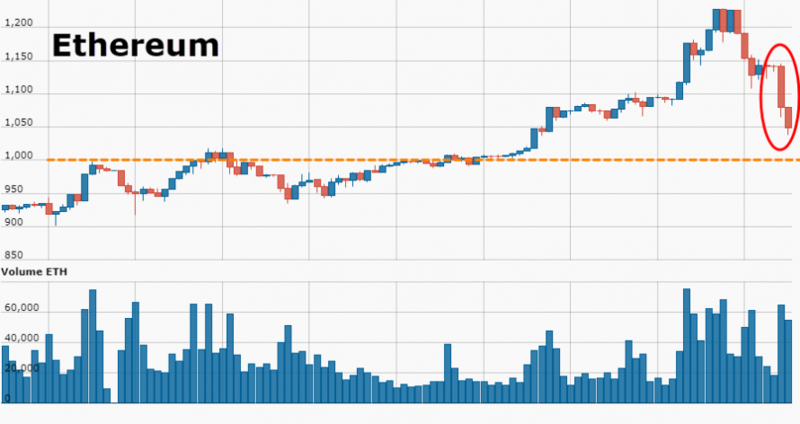 More than $100 billion of the sector’s total market value was erased over the last 24 hours, according to the site. On Sunday, it stood at $835 billion. On Monday, it fell to as low as $683 billion, and lately was at $722 billion. And ironically, or perhaps patly, the catalyst behind these sharp price moves had nothing to do with actual, market-clearing, price. 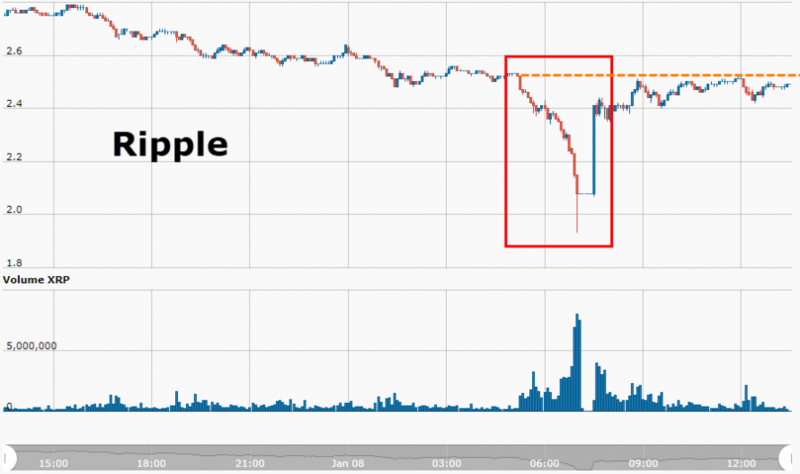 Amid headlines that South Korean regulators are inspecting 6 banks, including Industrial Bank of Korea, that provide virtual accounts to companies related to cryptocurrency, has sparked selling pressure across the entire space with Ripple down almost 20% today. There’s high possibility cryptocurrency transactions could be used in money laundering. South Korea to suspend virtual account- related operations of banks if they are found to have broken laws related to cryptocurrency. Regulator also strengthen probe into cryptocurrency exchanges over price manipulation, money laundering, pyramid scheme. Side effects of cryptocurrency "serious"; regulator will consider all measures including shutdown of cryptocurrency exchanges. Cryptocurrency fever in S. Korea is much stronger than other countries; regulator won’t let S. Korea take the lead in abnormal cryptocurrency trading. And the last few days have seen that Korean exuberance being smashed out of cryptos. 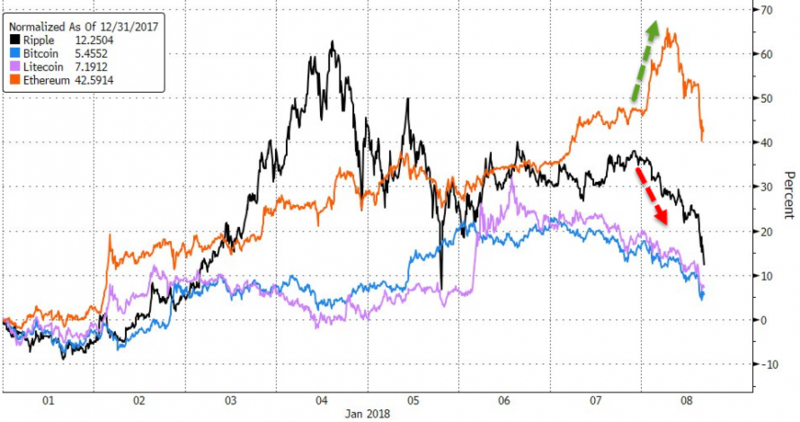 Ethereum remains the YTD winner for now, but as is clear Ripple quickly went from hero to zero as the volatile trading continues. 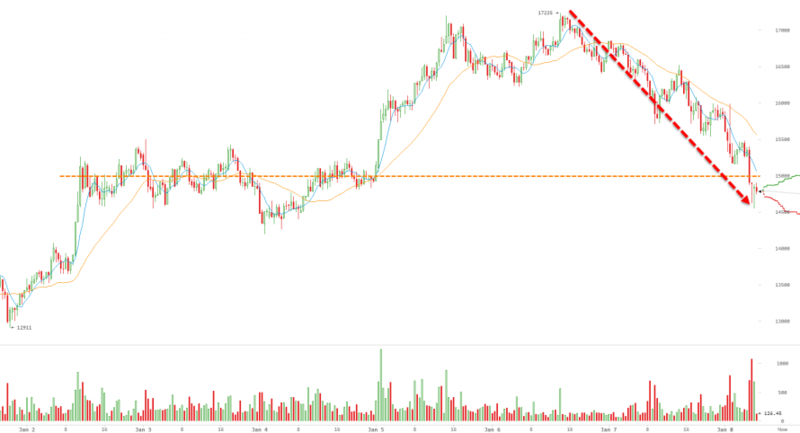 As CoinTelegraph reports, as speculative investments into Bitcoin and altcoins continue to trouble regulators worldwide, Korea has taken a hardline stance in recent months.